Government of Nepal has fixed the number of public holidays for 2076 BS. Government of Nepal has declared 15 days of National holidays for the upcoming Nepali new year 2076 BS (2019/2020). 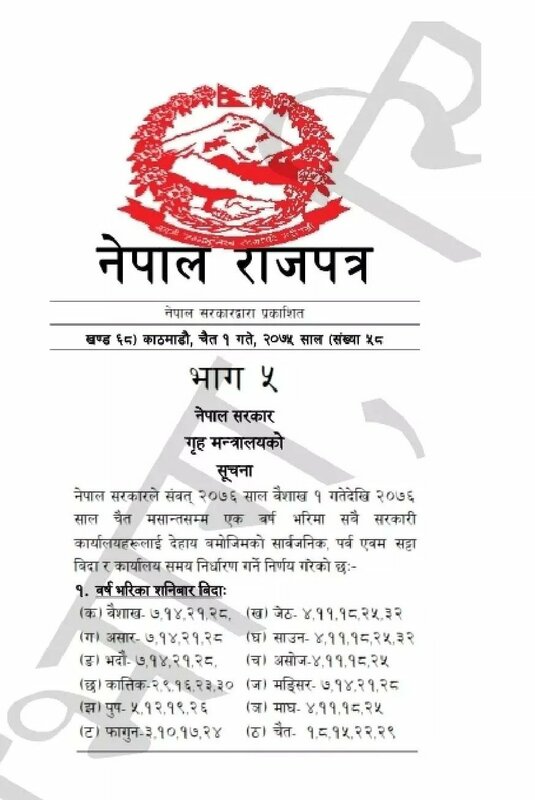 A notice published in Nepali Gazette declared public holidays on Nepali New Year's Day, May Day, Buddha Jayanti, Constitution Day, Dashain (5 days), Tihar (3 days), Mahashivaratri, International Women's Day and Holi. Government has decided to grant holidays to specific groups of people during festivals according to their cultures and religion. Women will have a holiday on Teej, people with disability will get a holiday on International day of disabled person and schools/colleges will have a holiday on Sri Panchami. Employees associated with emergency and essential services such as hospitals, rope-ways, police, immigration, prisons, fire brigades, Radio Nepal, Nepal Television, press, postal offices and telecommunications, may take leave in lieu as they are required to provide services even during public holidays, the new decision states.